Just read this news. 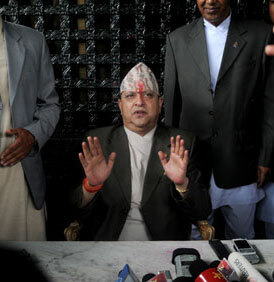 It looks like former King Gyanendra is yet to get over his delusions that this country belongs to him. For you kind information Mr. Shah, you didn't give up your throne , we kicked you out of it. Please stop patronizing us! No ones needs millions of people on street and 19 days of complete shut down to give up power voluntarily. Although we have ended up having 601 masters in place of you and the limits of our patience is being tested, it doesn't mean we want to go back to your rule. For DSP Jagdish Pokharel, I am so proud of you that you saved us from hearing some "improper slogan chanting" from RPP cadres! Boy what a grave 'threat' it was. I just hope someday you'll grow up and be a little more educated and more courageous (like the policeman we used to read in our textbooks) and do something worthwhile like catching actual criminals, making our neighborhoods safer especially during nights and making our lives easier. I hope someday you'll learn about a thing called "freedom of speech" which allows people to chant any slogan they like regardless of their creed, color, culture or religion until they physically harm others.